In a span of about a week in April, I made a point of getting out and photographing trains. I ended up shooting trains on April 14, 16, 17, 18 and 19, and I am going to share each outing in a separate post. Saturday, April 14thMy son goes to a class in downtown Winnipeg on Saturday afternoons, so I ended up with some time on my hands in the area. 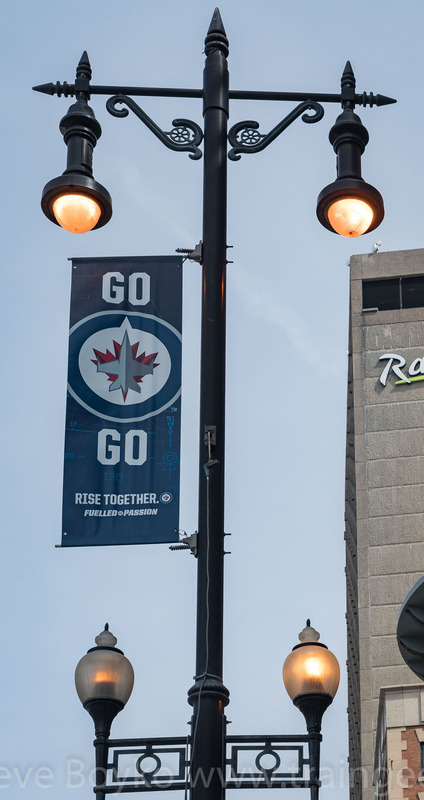 With the Winnipeg Jets in the playoffs, there are Jets banners and signs everywhere! I went to the Forks, which is a prime tourist area where the Assiniboine River flows into the Red River. 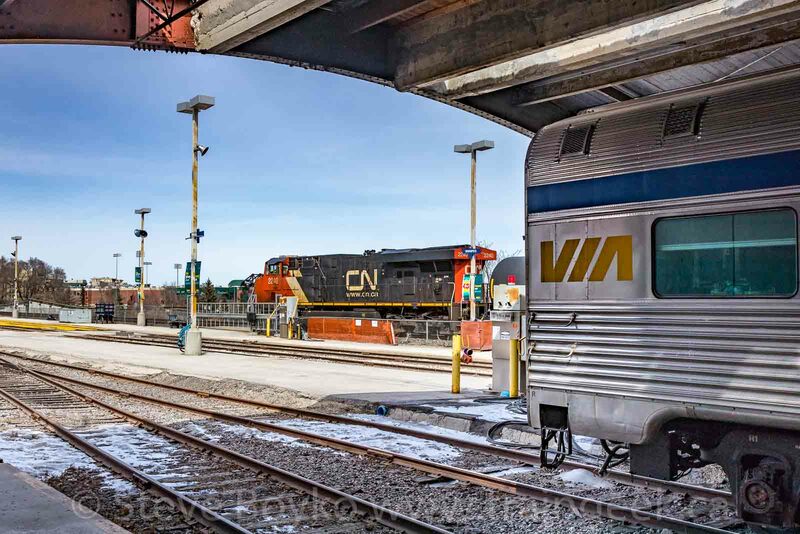 The CN Rivers subdivision and the CN Redditt subdivision meet at VIA Rail's Union Station. These days the CN line is busy but it is sometimes challenging to get a good photo angle. I was in the mood to try something a little different. I went over near the historic Nutty Club building. 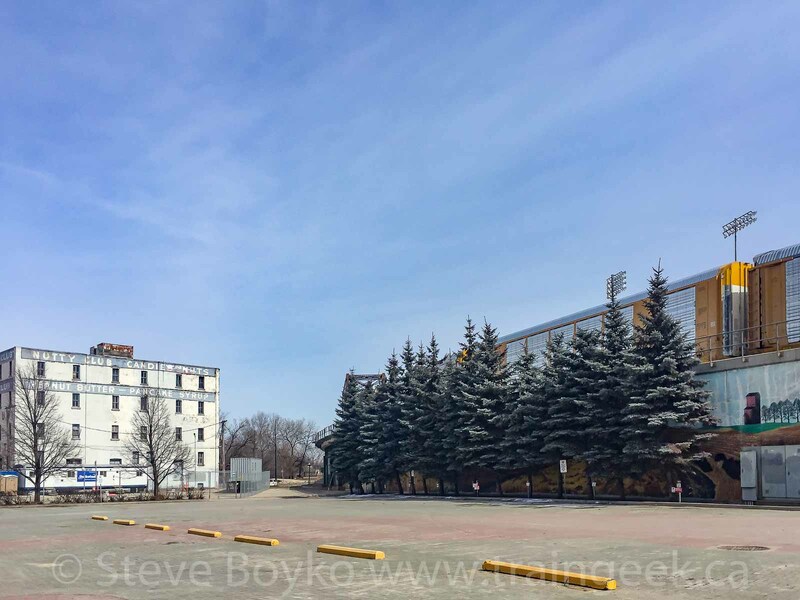 I was visualizing a photo that included that building and the CN line, and trying to figure out where to stand to incorporate both into a photo in a pleasing way. Ideally I would have a really tall stepladder so I could look straight down the bridge over the Red River and capture a train there with the Nutty Club building to the left. Since I don't have that, I tried this angle to see how it worked. I think it's OK but it's not ideal. I like the building but I don't like the large gap between the building and the rails, and I also don't like the trees obscuring a lot of the train. I keep thinking that it would be great to get some elevation. Maybe I need to make friends with someone in the office buildings nearby. I'd like to try a shot a little further left from where I was standing to close that gap. The baseball field, Shaw Park, is on the other side of the tracks and it would be nice to incorporate that too. I would need a wider lens, for sure. I tried this photo of the park with the CN line but the early afternoon light was all wrong. 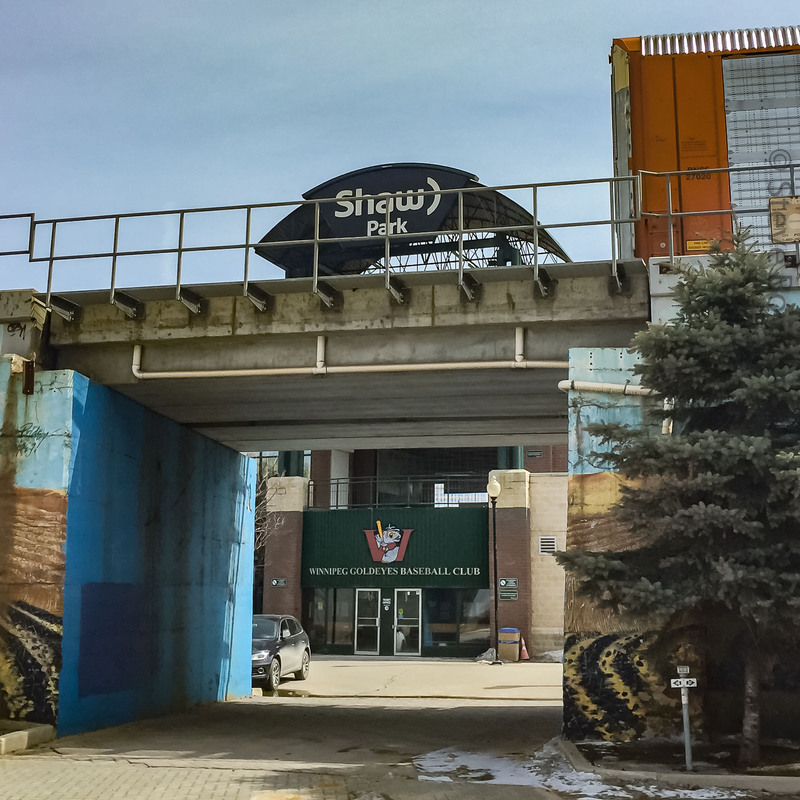 Shaw Park sign, bridge, and train... a winning / Winnipeg combination? I do think this angle has some promise with better light. After that train passed, I went to the Winnipeg Railway Museum. I was contacted a while ago by someone who is making a detailed scratchbuilt model of the Countess of Dufferin, the historic steam locomotive at the museum. They wanted some photos and measurements of the main driving wheels and the underside of the locomotive, so I took those. 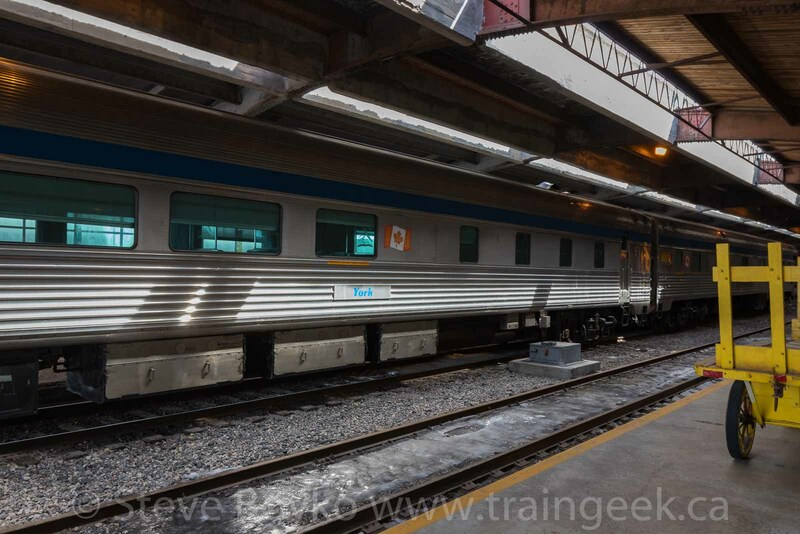 While I was there, I heard the rumble of an approaching train, so I stuck my head out the Dutch door between the museum and the VIA Rail train shed. CN 2240 was slowly pulling an oil train east, so I framed it up with the VIA "YORK" diner parked in the shed. I wanted to leave some empty space on the left for the train to "move into", but also include the diner car and the arch of the shed roof. It turned out pretty well, in my opinion. I was fortunate that the CN train was crawling along, so I could take the time to compose it the way I wanted. I'm not sure why the diner and other car were in the shed. A VIA engineer, who should know, was pretty certain they were there for training. I bought a couple of items from the museum's well-stocked gift shop, then left the station. 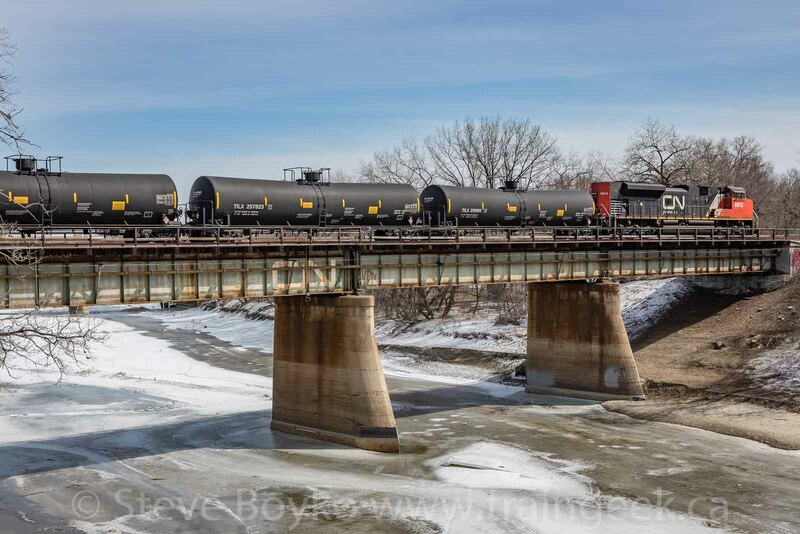 The oil train was STILL crawling along, so I walked over to the bridge over the Assiniboine River and photographed the tail end crossing the river. Note the lack of a buffer car - not required in Canada. It was time to pick up my son, so that was the end of my railfanning for the day. It's important to always be trying new perspectives, especially when you're photographing in a location you've been to many times before. Use your imagination and be willing to experiment. It's not always going to work out, but you can't find gold without sifting through some rocks. Stretch your photographic muscles and you'll be a better photographer.